As a member of the Cleveland Photographic Society www.clevelandphoto.org I’ve been privileged to gain access, with other members, to many places that the general public does not have access to. Cleveland’s Terminal Tower outdoor observation deck is one of those places. The views from up there are spectacular! While shooting the sunset from the outdoor deck I noticed the ore carrier Cuyahoga slowly making its way through a branch of the winding Cuyahoga River. 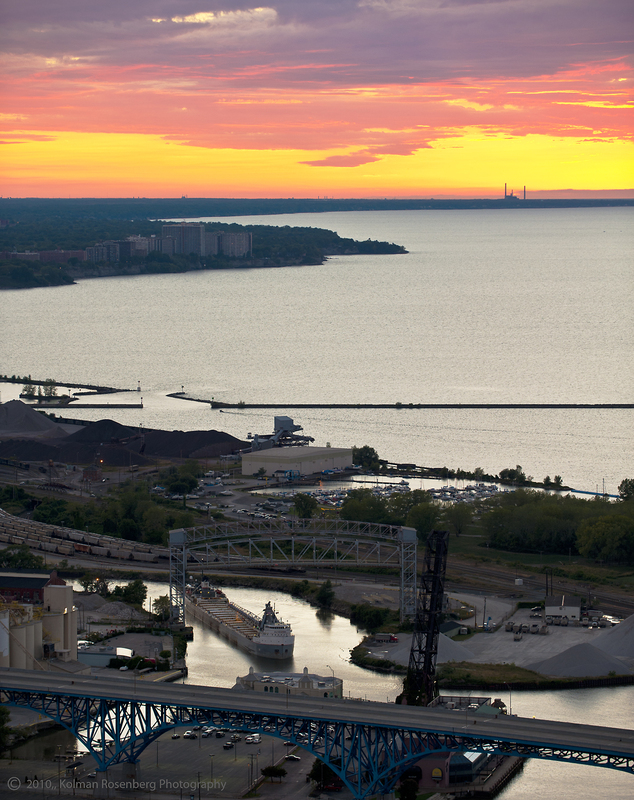 An ore carrier winds its way toward the mouth of the Cuyahoga River at sunset. The scene itself was nice enough with the blazing sunset and the Avon Lake CEI plant on the horizon, but I decided to keep track of the ore carrier as it made its way outbound into Lake Erie. Approximately a half hour later the ore carrier had made its way to the lake, the sun had set and the ship was leaving a wake behind it in the twilight. 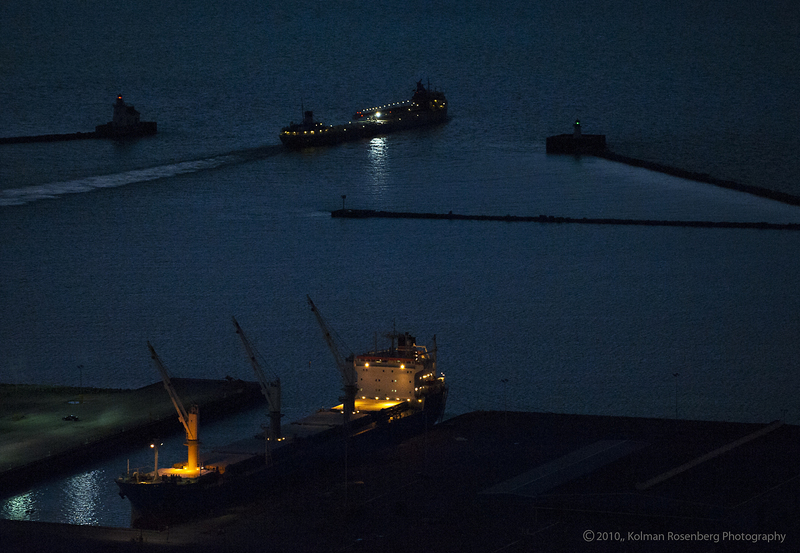 The ore carrier Cuyahoga leaves the Port of Cleveland at twilight. I was able to capture the ship just as the independently blinking red and green breakwall lights both lit simultaneously! It’s that time of day when most people stop shooting but I find it a beautiful time to capture some wonderful shots. To get them from the top of the Terminal Tower was a bonus! This entry was posted in Uncategorized and tagged Avon Lake, Breakwall, CEI, Cleveland, cuyahoga, Horizon, Illuminating Company, Lake Erie, OH, ohio, Ore Carrier, River, sunset, Twilight. Bookmark the permalink.